Here we go again. This time I am watching two wonderful, beautiful High-Quality Blu-ray’s. Two wonderful films transferred to High Definition 1080p perfection. Starring the one and only Charles Bronson. The movie is about Joe Valachi. Valachi is a targeted man. He has a price on his head. Mafia Don Vito Genovese who is in the same prison as Joe has put the word out and the price to kill Joe. Don Vito believes that Joe has ratted him out. Joe must at all means protect himself. Joe is in prison for drug trafficking. Because he has a bounty on his head he must struggle with the aspect of the Mafia Code, silence or speak out. It’s that speaking out reality that has him on edge and a targeted man. Joe must fight, struggle and survive. Always super excited to hear the announcement from Twilight Time when they are releasing a Charles Bronson film. As I have stated many times in the past reviews, I am a huge Charles Bronson fan. My favorite will always be, the Death Wish saga. I own every one of his films on VHS, and DVD, and now many of his films are coming out, or have already came out on Blu-ray. Bronson came from a time of cinema when, Manly men owned the camera. The tough guy persona ruled, and operated a no holds bar attitude of dominance in film. There was a time when the male figure demonstrated a control of the character they were playing. Now days the white ghost teeth, slick hair, metrosexual, male figure becomes somewhat laughable in cinema, compared to the brutes of men in the 40’s, all the way to early 90’s cinema. What happened to the days of the sophisticated tough guys like, Richard Burton, Yul Brynner, James Cagney, James Coburn, Bronson, Eastwood, Hackman, Lee Marvin, Gary Cooper. How Hollywood has missed the mark in not creating the tough guy persona, just amazes me in all its stupidity. Don’t get me wrong there are still tough guys, but the style, and approach has changed. The original tough guys did not have to demand your attention, they already had your attention, and Charles Bronson was that style. Also starring the amazing Italian actor Lino Ventura as the Don Vito. Starring in many French films before ever gracing American films. He was truly a one of kind. He had that suave attitude. He had that sophisticated reality about him. His main roles consisted of tough guy persona's or bad guys and even tough cops. He was a huge character actor in France. He starred in well over 70 films. His talent is something that truly shines when you see him perform. I would suggest you seek out his films. Dig into his Foreign films and discover his brilliance. Also starring the amazing multi-talented Jill Ireland a.k.a. Charles Bronson’s wife. I believe she acted in 15 films with him. She also was an amazing singer. Sadly, she died way to soon. She passed away at the young age of 54 to Breast Cancer. It was truly a sad reality. I think what is so amazing about her is some of the trivia of her death. She wrote 2 books about her battle with cancer. She was in the process of writing a 3rd when she passed. She became a spoke person for the American Cancer Society. Amazingly when she died, she was cremated and her ashes were put into a walking cane for Charles Bronson which might I add he was buried with when he passed away. Such a wonderful reality. If you ever get a chance head out to the Hollywood walk of fame and visit her star at 6751 Hollywood Boulevard and pay her some amazing respect. Also starring the brilliant Joseph Wiseman as the character Salvatore Maranzano. Now as you would guess if you’re a movie buff, there is the trivia for you. Wiseman was Dr. No in James Bond film Dr. No directed by Terrance Young, who yes directed The Valachi Papers. He was an amazing actor that graced the screen both large and TV small screen in well over 90 performances in film and TV. He was truly a one of a kind, and he will always be remembered as the first James Bond movie villain, it was awesome seeing him in this. The Valachi Papers was the original book published in 1969 by the wonderful author Peter Maas. I am a huge fan of Peter Maas. Huge reader of his books. He wrote some of the greats which many became films. He is the one and only biographer to the cop hero Serpico. If you have not read Serpico The Cop Who Defied the System then what are you waiting for, truly an awesome book. The book became the movie Serpico. Another amazing book and a personal favorite of mine is Marie: A True Story which also became a movie simply titled Marie. Also wrote another favorite of mine that I highly recommend In a Child’s Name: The Legacy of a Mother’s Murder. In 1997, he wrote the Mafia book, Underboss: Sammy the Bull Gravano’s Story of Life in the Mafia. Maas was an amazing gifted writer and journalist. His talent to me was a golden ticket of perfection when it came to telling a true story and bringing it to life for all to read. 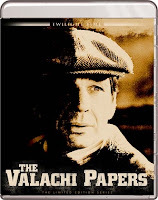 The movie The Valachi Papers has its flaws, but still honors this amazing writer. This is based on a true story although the movie and book alters some of the real reality, the movie changes a lot of the truth. So basically, the movie is more non-fiction than it is reality based. The movie is hokey at times and can be compared to a Drive-in B-movie in many spots. Don’t get me wrong the movie is not as horrible as I am making it sound, I am meaning that there is stuff in the movie that doesn’t fit or is not of the time the movie is based. Basically, poor production and editing made the film suffer. Valachi Papers has its flaws, but it is a film that stands out above and beyond many films. There is a true-life clarity to the film even though many aspects where changed. Young's direction brought to life a moment in time, a moment that should be remembered from its historical reality dealing with organized crime and the Mafia of the olden, golden days. 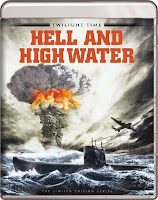 Hell, and High Water was directed by one of my favorite directors of all time, Samuel Fuller. A master talent in creating films that not only linger with you, but give you an experience in saying, WOW. His films are some of the greatest films ever created in cinema history. Many of his films are showcased as important pieces of film. He not only was a director, he was an actor, and writer of many of his films, or at least co-writer of films that he created. All one must do is look at his notches on his movie making belt, and realize that this man was a directing genius. 1963’s Shock Corridor, 1964’s The Naked Kiss, 1980’s The Big Red One, 1982’s White Dog. He was truly a gift of film making that left a movie loving world better because of his visionary expertise. Twilight Time has also released Two other of his masterpiece films 1957’s The Wayward Bus and 1955’s The House of Bamboo on their special edition Blu-ray. Hell, and High Water stars an amazing cast of performers. The amazing one of a kind Richard Widmark, and Victor Francen, and the one and only Cameron Mitchell. Also starring the beautiful Bella Darvi. Also, I must write up, keep an eye out for the amazing Asian character actor Richard Loo. Loo was truly a one of kind gifted actor that never got the stardom he deserved. He was so gifted. He played a lot of American Films as the Asian guy, or the stereotype that Hollywood thought of the Asian person. His long vast career lasted 50 years. Performing from 1931 all the way to 1982. He left a vast career of well over 100 credits to his name. He will probably be remembered mostly for his character of Hai Fat in the James Bond film The Man with the Golden Gun. Many times, he played an Asian General or Japanese General or simply a bystander. Many times, uncredited but always noticed. He can be seen in 1943’s Jack London, 1944’s The Purple Heart, 1945’s Back to Bataan, 1955’s Love is a Many-Splendored Thing, 1956’s The Conqueror, 1956’s Around the World in 80 Days, 1957’s The Quite American, 1966’s The Sand Pebbles, and so many others. It was great seeing him in this. He was always someone that stood out to me even though many of his parts where small or silent. He just had stardom all over him and it’s a true shame he never got that brilliant stardom he so rightly deserved. Thankfully companies like Twilight Time honor such character actors bringing forgotten films out on high quality Blu-ray. Hell, and High Water is about a Cold War plot. It’s 1953 a French scientist goes missing. Along with four others. Persons believe they have went to the other side behind the Iron Curtain, defecting. Add in your character Adam Jones played flawlessly by Richard Widmark. Adams is a former U.S. Navy submarine commander. Adams while in Tokyo is contacted by a Professor Montel. Montel along with other scientists and business men, suspect that the Communist Chinese are creating a bomb, not just any bomb, but an atomic bomb. Montel offers Adams a hunk of money if he will command an old-World War 2 Japanese submarine and figure out if the truth of the atomic bomb is a reality. Adams states he will if the sub is armed and if he can hire some of his old crew mates. So, begins the journey to figure out what the truth is. Now something I must mention that makes this movie more amazing is the cinematography by Joseph MacDonald. MacDonald captured a wonderment of film. He had such a talent in expressing a film, and Hell and High Water is a prime example of that. He has other films that have been honored with a Special Edition Twilight Time release such as 1955’s House of Bamboo, 1954’s Broken Lance, 1958’s The Young Lions which you can read reviews for all of them in the Twilight Time section of this website. That is something about Hell and High Water, the technical side, or the behind the camera reality creates a wonderment. The costumes, sets, and makeup all come off as brilliant in creating a solid film. I kind of sound like a broken record when it comes to reviewing the audio and video aspect. I feel like I say the same thing over and over, and, I do, but the truth is that it’s the same almost every time. No flaw here. Very seldom do I see anything wrong in this department. Twilight Time does an amazing job creating wonderful outlets to wonderful films. Perfect imagery and vibrant color and crisp clear sound quality. Partial Isolated Music Track: The music is done by one of my favorite composers in cinema history. Riz Ortolani has under his belt many of my favorite horror films or Italian films of the horror, suspense, thriller nature. From the one and only Mondo Cane in 1962, to 1964’s Castle of Blood, 1966’s Africa Addio, to the shocking masterpiece 1971’s Goodbye Uncle Tom. To the brilliant Giallo films like Seven Blood Stained Orchids, The Pajama Girl Case, Seven Deaths in the Cat’s Eye. The one and only, amazing Fulci Giallo masterpiece’s, and personal favorite film, 1972’s Don’t Torture a Duckling. But it will be the one of kind, shocking, disturbing, brutal masterpieces of horror that many will know him from the sadistic brilliant 1980’s Cannibal Holocaust. It was great hearing the partial music to The Valachi Papers. Isolated Music Track: The music in this film, composer of perfection. Alfred Newman. Alfred Newman was another pioneer of music. A composer and arranger and conductor of many, upon many pieces of music for film. The vast array of work under his belt can only show you his expertise at music, from, The Song of Bernadette, All About Eve, The Diary of Anne Frank, How the West Was Won, The Greatest Story Ever Told and many, many more credits to his name. What’s so different and amazing about Newman is, he only wrote music for film. This idea and concept showcases the beauty he had for film and that beauty always showed in the finished product. I must mention the success of his music was honored countless times, winning an impressive 9 Oscars and being nominated over 40 times. Two classic films. Two amazing Blu-ray’s. High quality transfers. Brilliant examples of how to treat older films. Both are highly recommended products. Two wonders to experience a double feature. Two different films equally treated with perfection.